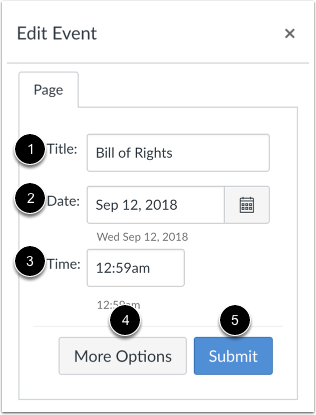 You can change the date of an Event or Assignment by clicking on the Event or Assignment or by dragging and dropping the Event or Assignment to a different date. This lesson shows how to edit a calendar item, but you can also delete items from the Calendar. Please be aware that deleting a Calendar entry also deletes the associated content elsewhere in Canvas. View event details by clicking the event you want to view  and clicking the Edit button . Here you can edit the event Title , Date , specify a time range , and Location . You can move the event to a different calendar using the Calendar drop-down menu . 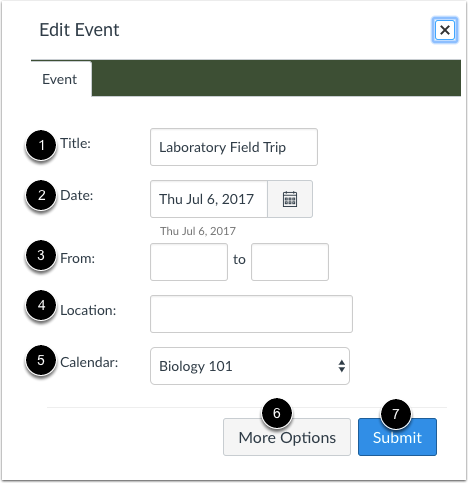 To add a location address or use the Rich Content Editor to add additional event details or links, click the More Options button . Otherwise, click the Submit button . If you assign student to-do dates to a page or ungraded discussion, the item displays in the course calendar. You can edit the to-do item Title  and Date , and specify a time . To edit the discussion or page, click the More Options button . Otherwise, click the Submit button . 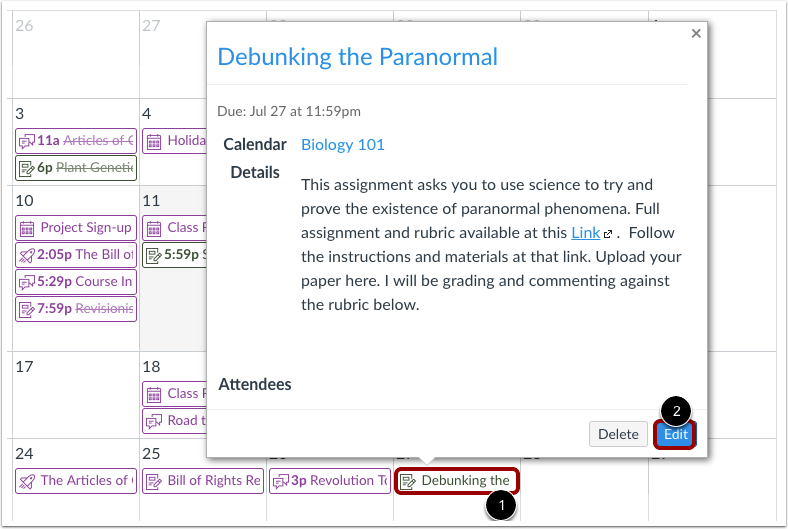 View assignment details by clicking the event you want to view  and clicking the Edit button . 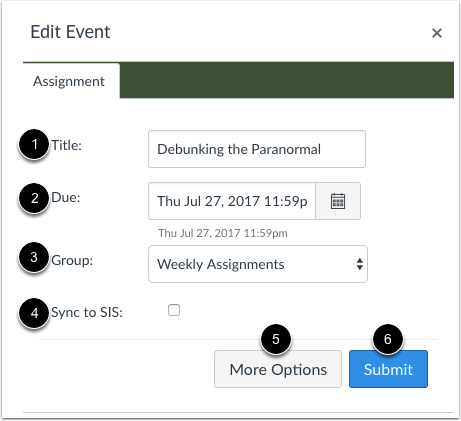 You can edit the assignment title , due date , and assignment group . If your institution has enabled a student information system (SIS) integration, you can manage the assignment to sync to the SIS by selecting the Sync to SIS checkbox . To edit assignment details, click the More Options button . Otherwise, click the Submit button . When editing an appointment created in the Scheduler, a different menu will appear than assignments or events. You can edit the description  or limit the amount of users for this appointment . To submit your changes, click the Update button . 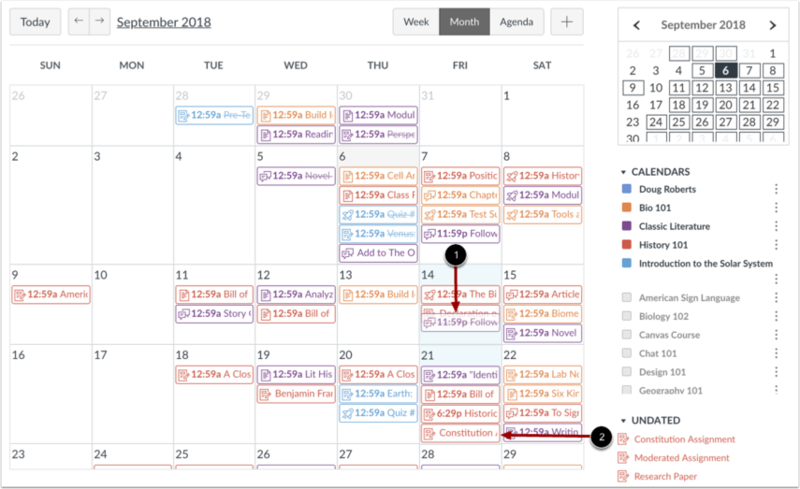 You can also change the date of an event or assignment in the same calendar by dragging and dropping the event or assignment to a different date on the month view or mini calendar . Click the event or assignment, drag to the new date, and release your mouse. You can add items from the Undated list to the course calendar by dragging and dropping the item to a desired calendar date . Adding items from the Undated item list to the calendar assigns them a due date and removes the item from the Undated list. The item displays on the student-specific List View dashboard and in the global and course home page to-do lists. 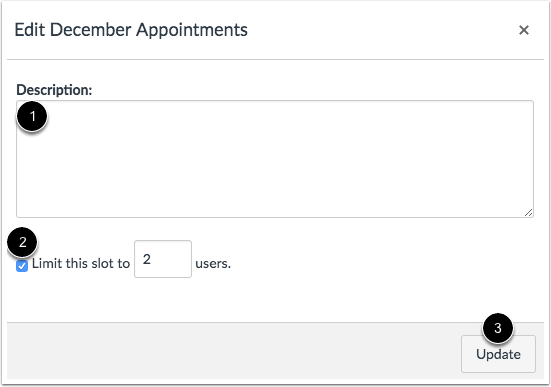 Note: You cannot drag and drop appointments created in the Scheduler. 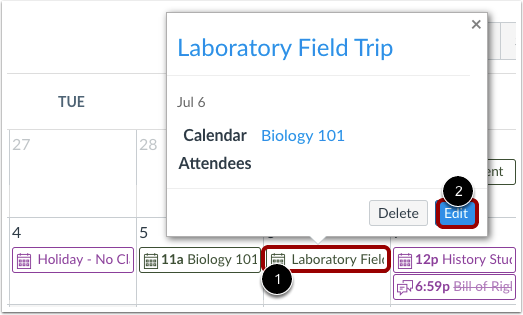 You can drag and drop undated assignments to and from the month view of the calendar  or mini calendar . Notice the due date of that assignment will change to 11:59pm on that day. Moving events or assignments to the undated items section will remove the date. Previous Topic:How do I add an assignment from the Calendar? Next Topic:How do I set a different event date for each section in a course calendar? Table of Contents > Calendar > How do I edit an event or assignment in the Calendar? Re: Course summary below syllabus, how to delete? Re: How do I delete an assignment from Canvas?